"This image was taken in Central Park, New York," said Martin Herrera Soler. "I guess these things only happen in New York? I never got to really know why this couple went o grab a hot dog... perhaps the reception food was not so good?" Martin captured the newlyweds with a Canon 20D, ISO 400, 1/160 and f5.6. Actually, these aren't newly weds in all likely hood. You see couples like this all the time around the found next to the boating lake. It is traditional for their culture to take wedding shots on a different day to the actual wedding. Bizarre, I know, but at least they can chose a good weather day! Ah, in Malaysia, we do different days all the time. It saves on the stress of the day itself - often we have time pressures and family from both sides coming together. 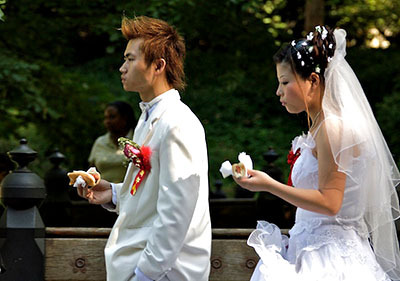 Chinese weddings start in the morning with a Tea Ceremony to each side, travelling to both homes, then end up at lunch. That's the time to do the studio or wedding photos, sometime around then. Afterwards, you have a rest or siesta and put on evening gown and have a wedding dinner. It's a full day, so if the wedding photos can be done on another day, it's easier. Our little guy has been a mess lately, so we've taken him to do terrible dog training and so far have been amused to keep our furniture as is! Does anyone else have any experience with a 2 year old hound performing like a one month old?! I value the help.